I’m a fool for racing, I think this is fairly clear. So it surprised nobody when I suggested our very-long-term KTM RC390 ought to see some track action. And the opening up of the Australian Production Championship to over 300cc machines created the perfect opportunity. Sourcing the parts to make the KTM race-ready posed a problem, as no one had yet raced one of these bikes in Oz. A wish list was swiftly dispatched to KTM, and the essential parts gradually started to appear one by one at the door of Horror HQ. With time ticking away and two rounds of the ASBK series already run, finally the bare essentials needed for the RC390 to pass race scrutineering arrived just in time to put in an entry for round three in Perth. Genuine KTM engine protectors as well as an enclosed lower fairing were fitted to comply with the general rules of racing, the engine oil and coolant drain bolts and filler caps were drilled and lock-wired along with the front caliper bolts, and the coolant flushed out and replaced with water. With these basic requirements of racebike safety satisfied, anything else to make the KTM as competitive as possible would be a bonus given the short amount of time there was to prepare for its race debut. Production class rules allow full race exhausts and recalibration of the ECU with an approved aftermarket fuel metering device, but all I had available for Perth was a road legal Akrapovič slip-on silencer, complete with catalytic converter. A quick run at Dynobike in Moorabbin revealed the 373cc single to be kicking out 29.4kW in this trim. Not a bad figure for this class of racing, and with plenty of potential for improvement with a race exhaust and tune-up. The racing in Perth rewarded our little Kato with second place for the round in the Australian over-300cc production class. 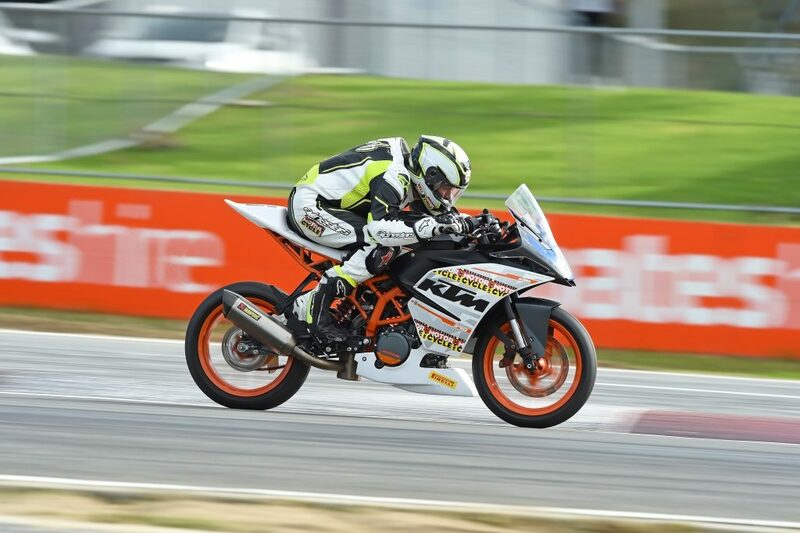 A fantastic debut for KTM in the class, and showed the potential of the RC390 once fully sorted for racing. On one hand, running revalved standard suspension without any spring or damping options was my biggest handicap, but then again the results show how fast the RC can go on stock suspension. Aftermarket shocks and fork internals have been legalised for the class this year, and those items are the next big step towards getting the best out of the RC390 on the racetrack. At this stage I’m not sure if it will happen for the Morgan Park ASBK round, or whether I’ll have to wait until the last round at Winton. For now, I’m back to waiting for the postman to come knocking.